There are many VPN services new to the market or the ones that are free. But disappointingly a very few are efficient enough to provide you the adequate protection. Such a name is TunnelBear VPN. Tunnebear VPN provides you with many opportunities such as unblocking blocked websites. Also streaming and download content and much more. But what a user wants while doing all these stuff? The primary priority is security, and that’s why we are here with TunnelBear alternatives. Some of the VPNs used by many internet users could also be vulnerable without people knowing about them. Researchers from the Sapienza University of Rome and the Queen Mary University of London published a study in 2015, which shows security lacks in 14 VPNs including Tunnelbear. Those can reveal the entire browsing history of users either through “IPv6 traffic leakage” or “DNS hijacking” but Tunnelbear found with both. Although, the TunnelBear has conducted an audit of the vulnerabilities found again in 2016 and has claimed to fix them later in 2017. But, most users wouldn’t want to take risk after such exposed vulnerabilities especially when there are potential and active VPN providers. Does That Meet The Purpose? The sole purpose of which users are immensely choosing VPNs for themselves is online privacy. If you are unprotected while browsing stuff and unblocking than hackers, government agencies and ISPs could easily track you. Therefore, all other benefits are shaded if you are not getting anonymity and privacy. This is where TunnelBear is risky and vulnerable. To cater the VPN questers in finding out an appropriate VPN provider for themselves, we have sorted out some of the best TunnelBear alternatives. TunnelBear is a Virtual Private Network that offers both paid and free service which was founded in 2011 and was based in Canada. However, earlier this year, on 8th March, a significant announcement regarding TunnelBear VPN states that the antivirus company McAfee acquires the VPN. According to McAfee, they have plans to integrate TunnelBear’s technology into their VPN product, Safe Connect. Now, the TunnelBear VPN service is liable to follow the US law, yet the VPN team will keep working on the TunnelBear products under its brand. The two providers have a motive to work together and to provide users with the best solutions for online security. The TunnelBear VPN offers free as well as paid service among which the free version is excellent in my opinion. Yet, there is not much with the paid service of TunnelBear. Both the versions have the same features with just the data limitation of 500GB in free. There are total 20 countries in which the TunnelBear servers are present. Also, you can connect five devices simultaneously with one account. It supports all the popular platforms including Windows, Mac, Android, and iOS, as well as it offers the extensions for Chrome and Opera. The speed performance of the VPN service isn’t so good as well as there were some glitches with the Windows app. The Tunnelbear website is informative, and the service is exceptionally easy-to-use, but they don’t have live chat support. The email response was received within 6-7 hours, and the answer was beneficial and well elaborated. Social media platforms are becoming an essential source for both, experience sharing and suggestion gaining. Also, while selecting any of the product people trust the experiences and reviews of the users already using that. Likewise, for the VPN customers or the people want to have VPN such reviews must be helpful in decision making. However, it could also increase their knowledge about VPNs. An essential factor for any VPN service is its customer support which could frustrate user if it has flaws. This is what a user is complaining about Tunnelbear who might haven’t got a response to his addressed problem. A Redditor has shared his detailed experience for TunnelBear VPN encompassing various issues and also a disappointing response received from the VPN provider.Comment from discussion Really bad experience with TunnelBear. TunnelBear provides you two encryption protocols which are, the OpenVPN and IPSec/IKEv2. The users of Windows, Mac OSX, and Android could use the OpenVPN protocol. However, the iOS clients have the options of Layer 2 Tunneling Protocol (L2TP)/Internet Protocol Security (IPsec) or Internet Key Exchange version 2 (IKEv2). Therefore, anybody willing to get OpenVPN on iOS will have to use third-party connection software. Except the iOS 8 and older versions, all the platforms have the ability to use 256-bit AES encryption along with SHA256 authentication. The iOS 8 version has the encryption of AES 128-bit with the authentication of SHA-1. For providing the better security and privacy authentication, the TunnelBear VPN has conducted the third-party audit. This audit results in positive claims regarding the privacy of the provider and seconds the security promises which are made by the TunnelBear VPN. In addition to the VigilantBear (kill switch), the TunnelBear has recently released two Beta fixes for solving the issues of IP leak. These additions could help in preventing the IPv6 leaks and IP leaks in case your VPN connection goes down. You can switch to the beta version if there is a need. Otherwise, you should remain stick to the kill switch feature. Here are the top recommended options instead of TunnelBear. UltraSurf is a free VPN proxy that enables you to bypass internet restrictions with appropriate privacy protection. It could be an intelligent choice for TunnelBear alternatives as it provides identity obscuring as well as clears browsing history to protect data from snoopers and trackers. It has been rated 4.6 out of 5 on Google’s Web store which shows a good review of people all around the world. UltraSurf VPN has given much reliabilities to the VPN questers with a natural connecting process having no registration and no login frustrations. With this free VPN, you could unblock popular websites and content without facing the limitations on things such as bandwidth. They have released a Beta version for their Android customers for whom it will be an easy task to connect to Wifi, 4G, 3G and all the mobile carriers. Spotflux Lite could be an efficient option for tunnelbear alternatives as it has gained more than 30,800 users on Chrome web store who have ranked it 4 out of 5. To achieve such response from the users is a feature reflecting satisfactory performance that could have been experienced by them. Spotflux VPN is a free service that presents users with some of the extraordinary functionalities among all the free VPN services. It gives you adequate protection against common online threats such as data tracking or cyber attacks. With Spotflux you could evade intrusive ads, tracking cookies and another such thing which endangers your privacy. Also, you could enjoy safe internet while traveling as this VPN secures connection even if you are connected to a public Wi-Fi. SurfEasy free VPN service has almost 75,000 users and has given the rating of 5 out of 5 in Google Web store, and this is something astonishing. Getting full stars from the users is an extremely unusual thing. It provides bank-grade encryption to the online traffic of the users, therefore gives it a potential security against prevailing threats. You could get an OpenVPN protocol as a default on your Mac, Windows, and Android. One of the most important causes for which they are getting good user response is their excellent customer service through which the user issue is catered shortly and efficiently. It also helps you to bypass firewalls and online restrictions with various server locations that make online browsing really efficient. Hotspot shield is an extremely popular VPN extension as Chrome has gained more than 1,653,300 users with over 500 million downloads all around the world. It could be the best of all the tunnelbear alternatives an individual could opt. Hotspot shield is extremely easy to enable and connect with just a single click. However, the features it provides are many with some newly induced ones such as Ad blocking, Tracker blocking, cookie blocking, and malware protection. They claim to cater their free service users with almost all the features they provide with the premium version. With Hotspot Shield, you remain anonymous while unblocking without the annoyance of bandwidth limitations. Hotspot shield has the ability to secure the unprotected websites and could bypass restrictions with a decent speed. Another popular VPN extension is Zenmate VPN that could be an intelligent choice against Tunnelbear alternatives. According to the ratings shown by the Chrome web store this VPN, the extension is rated with 4 out of 5 stars. Not just that, the user population for Zenmate is immense i.e. almost 5,146,000 all around the globe. Such level of trust on Zenmate VPN has been developed due to the efficient and long feature list this VPN has to offer. The most prominent feature is that they have a vast number of server located countries that is 30. Therefore, it’s extremely easy for you to unblock websites by switching between these servers when one is not working. Also, the speed which you would experience after being connected to Zenmate VPN is a decent one and doesn’t show a considerable fall. Here are the most asked question about Tunnelbear services, protocols, and encryption. In the lists of free VPN services, you can easily find TunnelBear somewhere above in the list. No doubt that this VPN provider has very less variation in features of their paid version and the free version. However, the data limit of free plan is just 500 MB which would not allow you to check the video streaming speed and quality perfectly. But, a good thing about it is that you have access to all the servers except the Australian server which is just present in the premium version. Also, the latter introduced feature of IntelliBear is not included in the free version. Luckily, you could increase the free version data limit to 1GB if you post a supportive tweet for them. On the other hand, they have two more plans which are paid. The monthly plan is at a price of $9.99 per month for which you get all the features along with unlimited data. The other paid plan is for 12 months (1 year) which provide an immense discount of 58% per month. In this plan, you are required to pay a total amount of $49.88 which makes up to $4.16 per month. The security perspective of TunnelBear VPN also depends a bit on the location and the internet regulations at that place. As mentioned earlier, TunnelBear VPN is a Canadian based provider and according to that, you can be under surveillance. The Canadian government implements laws such as C-51 which have some strict regulations. Also, Canada is a part of five eye surveillance on the basis of which they could share the citizen data to other member countries. Also, it is necessary to note that, TunnelBear VPN has made it clear that a user should always accept the laws of their country and the one in which a provider is located. TunnelBear has a notable list of prominent and some distinctive features for which it could be considered as an adequate VPN service. The first and the foremost benefit with this VPN is that it provides a free version without feature limitations and therefore, you can get an idea about its services. There is an option of connecting 5 devices simultaneously no matter which plans you are using. The second main thing which is a great benefit of using TunnelBear VPN is the ease-of-use and the website structure. Their website has almost all the information for which a user could be in search of. The navigation on the website is straightforward and an individual could easily find all the information with clear instructions. The TunnelBear VPN also works in China as long as you download and install it before arriving. Some distinct and rare VPN features are also provided by the TunnelBear. The IntelliBear (VPN tunneling), VigilantBear (Kill Switch), and the anonymous IP features are included in their service. The IntelliBear feature provides you an opportunity to separate the websites you want to tunnel and which you don’t want to tunnel. 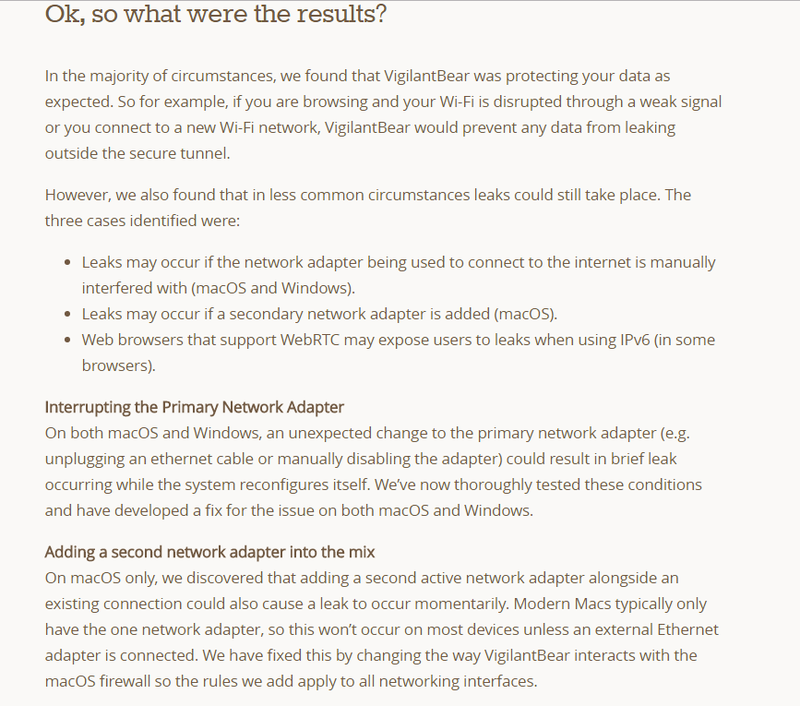 The VigilantBear feature helps VPN leaks through automatic internet disconnection when there are sudden VPN drops. However, there are some drawbacks with TunnelBear VPN which couldn’t be ignored. TunnelBear VPN doesn’t allow you to torrent. This is because; the VPN provider abides you to follow the Canadian laws and they technically restrict P2P torrenting and file sharing. Also, there are many VPN services which are blocked by Netflix. Therefore, it is most probable and tested that the TunnelBear doesn’t work with Netflix unblocking. Regarding the customer support of TunnelBear VPN, it is necessary to mention that the live chat support is not present. The only way to contact the customer support team is through the email and this means that you have to wait long. The company stores your email address, first name, the total amount of monthly data used, and the OS version of your device. 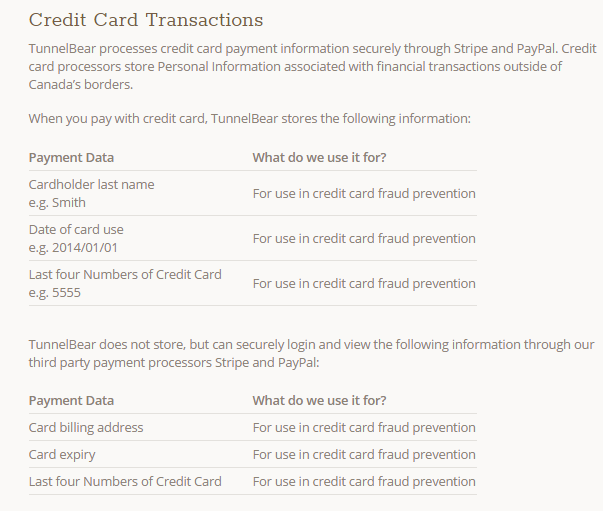 The TunnelBear VPN also mentions the list of data that is not stored by them. They don’t collect the real IP address of a user and the one which is assigned to the user. Also, they don’t keep a record of websites a user visits during the internet browsing. There are many positive as well as quite negative reviews regarding the TunnelBear VPN on the social news and discussion website, Reddit. Below are some prominent comments of what the users of TunnelBear think about the features and the service.Comment from discussion Thoughts on Tunnelbear? Is it reliable?. Comment from discussion Thoughts on Tunnelbear? Is it reliable?. This comment about Netflix streaming is a bit confusing as I was unable to connect Netflix with TunnelBear VPN. However, there are some comments which show that some servers could unblock Netflix.Comment from discussion Torrenting with TunnelBear. For this comment, I must mention that the torrenting is forbidden in the service of TunnelBear and for the clear answer you could contact the support team. Also, there is a chance that the VPN monitors your torrent traffic and if not blocked then your data could be handed over for DMCA notices.Comment from discussion Tunnel Bear has the best updates.. Comment from discussion DO NOT BUY TUNNELBEAR, too inconvenient to be of use.. The slow connection of TunnelBear is also equipped with the disconnection issues. This could leave you vulnerable to cyber threats and identity exposure. The reason for frequent disconnections of TunnelBear is that it uses only one internet connection to transmit all the data to the VPN server. Even if there is a single drop to your Wi-Fi signal, then the TunnelBear VPN connection will drop. Comment from discussion Thoughts on Tunnelbear? Is it reliable?. Before testing the TunnelBear VPN, I have listened a lot about the lagging speed and slow internet connectivity with their service. When I tested the service, the speed goes down to 50% as compared to my normal internet speed without VPN. Also, there wasn’t a vast difference in speed of different servers, however, the UK servers performed most adequate. If you compare this speed with other VPNs performance then you might see it above many. Yet, there are some cheap as well as reputable VPN such as PIA. Also, there are VPNs like ExpressVPN that outperforms all in speed and overall features. The TunnelBear free version is better as compared to the other free VPN services. However, if you just want encryption and security then TunnelBear is a good option but if you intend to perform some other activities like streaming, unblocking and torrenting then you shouldn’t consider it. This is because the P2P file sharing is not supported by TunnelBear and the VPN speed is also a bit lagging. Knowing all the security flaws into a service, nobody wants to stick with it and that might be the case of TunnelBear users who are looking for the TunnelBear alternatives. We have discussed the best free VPN alternatives, yet it is important to clarify that a free service provider takes benefit from one or other way. So, be cautious that a free VPN could risk your privacy. Therefore, it is recommended to consider a genuine paid VPN but the individuals requiring regular protection could use free VPN services also.